My Thoughts: I am a big fan of history. I love studying it, watching historically based movies and reading historical fiction. 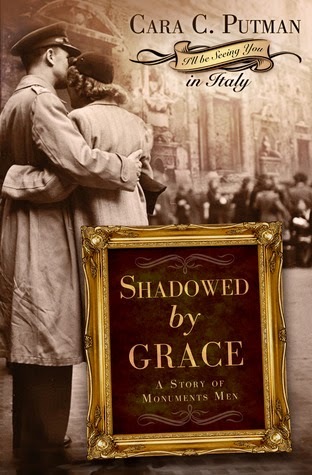 I felt that Shadowed by Grace was sure to be an excellent read. I have little to no knowledge of the Monument's Men and the important work that they did during World War II so I was excited to read the story of Rachel Justice and Scott Lindstrom. The story was really well written with, what I am sure was a large amount of research done by the author. Cara Putman weaves together a story of a woman seeking to find a lost family member, of a man following his passion for art even if it leads him to a war zone, of determination and faith in humanity and in God into a wonderful work of historical fiction. With action, mystery and romance all blended together to make a snapshot in a moment of history where two people were Shadowed by Grace that only God can give. Read More from Cara Putman on her website.